The problem, however, was no match for a high-flying coatings team. Steeply-sloping substrate? Check. Rappelling like Batman? Check. Battling ladybugs? Read the story and find out. A jobsite visit yields a unique perspective on one of the largest on-going coatings projects in the nation - the painting of Louisiana's Huey P. Long Bridge. Concrete. steel. cinderblock, plywood - an enterprising coatings crew covers it all as a bustling winery perpares for the harvest while opening a new estate building. 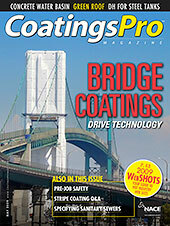 When a historic bridge needed a facelift, the owners turned to the coatings crew who worked who worked the span before. But mother nature and the bridge itself had some surprises. Working in an usnusual setting, these highly trained coatings professionals quickly find a groove doing what they do best - demoing and instlling floor coating. Over the course of two years, a coatings crew and manufacturer have worked together to line and protect the nations fuel storage tanks. 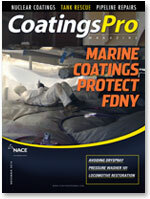 Coatings professionals are constantly putting out fires for their customers, but in the case one marine coating company, putting out fires is the primary job of a recent customer - the fire Department of New York. The first large-scale use of any product is always daunting. When it is on a 20,000 sq ft floor in a pharmaceutical packaging facility with a tight deadline the stakes are even higher. 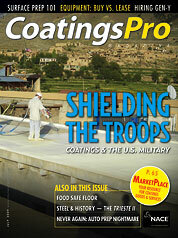 Relining the interior of a portable water tank is a straight-forward project that mushrooms into unforeseen problems for an experienced New Hampshire-based coatings crew. With heavy publicity, and safety on the line, fireproofing Las Vegas' biggest commercial development to-date is a high-stakes. all-in-or-nothing project. Epoxy and polyurethane systems combine to create a waterproof rehab for the concrete pools at one of the Brookfield Zoo's most popular attractions. Rugged job site, unique safety issues, and a challenging structures makes things "interesting" for the crew coating a penstock on a New Jersey mountainside. 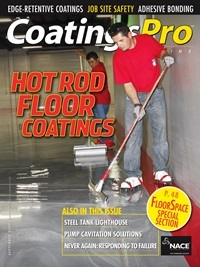 From blow torches to pouring red lava epoxy, a motivated coatings team uses muscle to turn a problem garage floor into a dream auto showroom. Innovative coating and insuation technology is helping the Army not only cut fuel use and emissions, but is also saving lives. Keeping California's famed Vincent Thomas Bridge coated and "close-up-ready" is a full-time job for a dedicated crew of coatings applicators.